Forget everything you know about the South of France! This corner of the country is so much more than lavender fields and golden beaches (although we highly recommend you take in a few of these too). If we were to start a ‘did you know…’ about the area we’d be here for ages, so let’s just say there’s plenty of surprises waiting for you here! You don’t have to go to Italy to find Roman amphitheatres and its natural beauty extends far beyond those colourful fields. So you could be making the most of mountains, gorges and historic monuments before you know it! For the inside scoop, dive into our guide on things to do in the South of France. Long a hangout for the rich and famous, you could travel as far back as the 18th century and find wealthy merchants and aristocrats in Nice. Although at the start they’d simply stop here on their journeys to the already glitzy Italy. But like so many who visit these shores, they liked what they saw and decided to stick around. And who could blame them!? 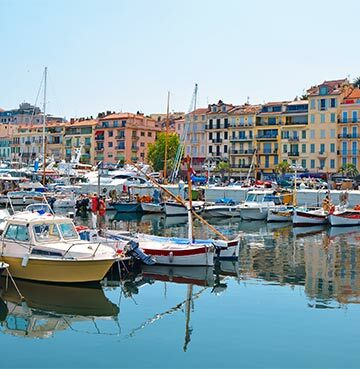 With gorgeous beaches and a much warmer temperature than the bleak winter months back home, the South of France soon became a sunny retreat for those with cash to splash. 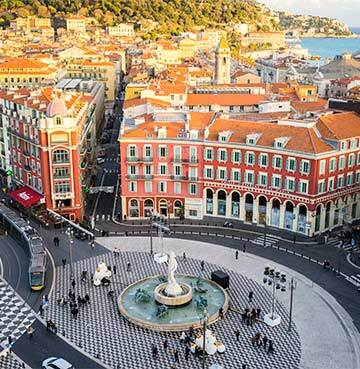 And long before this, the Greeks and Romans fell under Nice’s spell – so you’re in good company with a trip here. At the heart of Nice sits Place Massena, one of those lively squares where you just don’t know where to look! The fountain and its statue might grab you first, but your gaze soon wanders to the colourful Neoclassical Italian-style buildings and checkerboard floor. A unique combination that you definitely wouldn’t choose for your own home but Nice manages to pull it off with an effortless stylishness. You’ll struggle to find anywhere that’s as synonymous with luxury yachts as beautiful St. Tropez. And if that’s not a sign of just how upmarket and exclusive this part of the South of France is, we don’t know what is! There’s nothing better than stopping for a drink and bite to eat by the harbour, while boats worth thousands or even millions bob up and down. Although St. Tropez attracted the attractive and wealthy long before the most recent crowd sailed in. Creative types like writers and artists sprinkled some flair over it centuries ago and in the 1950s world renowned actress Brigitte Bardot leant some Hollywood chic to the coast. Catapulting St. Tropez and its beaches into the glitzy stratosphere! Its glam reputation has gone from strength to strength ever since. In simpler times, St. Tropez was a quaint fishing village basking in the Cote d'Azur's glorious sunshine. And although you might have to look a little harder today, there’s signs of its seafaring past dotted all around. Keep your eyes peeled for fisherman’s houses down by the harbour. Worlds away from the luxury boats on the water, there’s something elegant and endearing about these simple buildings. There’s plenty more traditional gems in the old village, with rustic red buildings that stand out against the blue of the sea. The chapel here even holds a statue of the Roman Soldier Torpes, who lends his name to this famous seaside retreat. Although he came to a pretty gruesome end, so we won’t go into detail – you’ll simply have to find out for yourself. Famed for its International Film Festival, Cannes always rolls out the red carpet for holidaymakers craving the finer things. Trendy boutiques, exquisite cuisine and golden beaches – it doesn’t get much finer than this! Just like its chic neighbour St. Tropez, yachts fit for a multi-millionaire casually bob on the turquoise sea. Indulge your inner celebrity and take a stroll along the waterfront, picking out your favourite boats and spotting exotic flags blowing in the breeze. There’s nowhere better for stretching your legs than La Croisette, more than three kilometres of seafront promenade. Stop in the shade of a palm tree, cool off at an ice cream stall or simply see which restaurants smell too good to walk past. Swap spotting yachts for designer shops on Rue d’Antibes, where a shopaholic’s paradise meets architectural delights with a story to tell. Gorgeous 18th century houses have been transformed into high end boutiques, meaning those clothes and handbags are even more likely to catch your eye! Enjoy a little window shopping, spot an intricate design on one of the houses – this is a shopping experience like no other. Take a break from the seaside sparkle and head up into the hills, where the spirit of old Cannes lives on. Le Suquet was once home to fishermen, who’d head down those steep hills and sail out to sea. Luckily you won’t have to carry your rods or catch of the day on your way up these slightly challenging paths. So simply make the most of the car free village as you stroll along narrow paths, taking in quaint buildings and charming courtyards. The old castle is now an art museum, its church is a sight worth every steep step and the views over Cannes below are simply priceless. Cannes really does offer the best of both worlds! Nature’s calling in Camargue National Park, where there’s just so much to discover. Home to salt pans, lakes and lots of wild animals, there’s a little bit of everything for lovers of the great outdoors. Birdwatchers are in for a real treat too, with many migrating birds stopping here in the summer and autumn. April to September is your chance to spot the pink star of Camargue’s show! Flamingos breed here until June and stick around for a few months after. The park’s also home to its very own ebony and ivory duo – the wild white horses and brilliant black bulls! Why not take a leisurely trot on horseback? An amazing way to explore Camargue, as you take in the mountains of salt and marshes dotted around the national park. 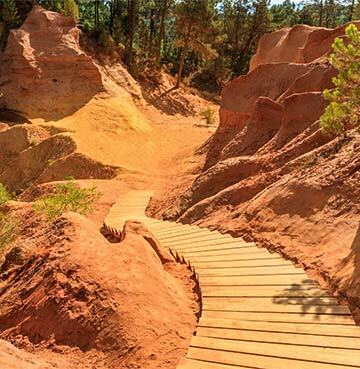 Our colourful journey through French natural beauty takes us to the reds, yellows and oranges of Roussillon and its Ochre Trails. With sandy shades that wouldn’t look out of place in a desert or canyon, a hike here feels like a real adventure! Its clifftop trails weave their way through trees and often look out over the two quarries below. A little shade and lots of amazing views – what could be better? From certain angles you might struggle to tell where the Ochre ends and Roussillon begins, with its reddish buildings that mimic the natural beauty around them. But with the two trails lasting 30 and 60 minutes, you’ll have plenty of time to explore the village before you head home. There’s more wonderful red rocks to be found closer to the coast too! 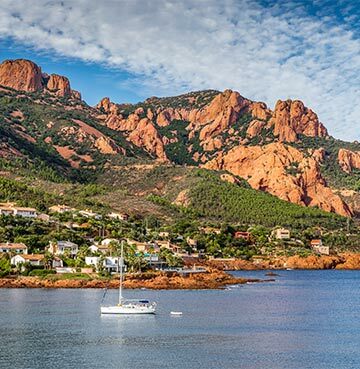 The Massif de l’Esterel is a low lying ochre mountain range, with plenty of opportunities to stretch your legs. And with its more modest height, you won’t be faced with a daunting task as you gaze up toward the top. These are trails that you can conquer! And stunning views out over the Mediterranean Sea are another incentive to get those legs moving. Just get ready for a few wildlife stops along the way, with boar, stag and reptiles roaming freely among the orchids, eucalyptus and valley roses. Not all of our boots were made for walking, in fact some of you probably prefer flip flops and bare feet in the sand. So why not head down to one of the amazing beaches that the Massif gazes longingly over. From stunning reds to soothing blues! The shimmering canyon of the Gorges du Verdon might feel a million miles away from these rocky mountains, but in reality it’s just a few hours in the car. Its limestone has been worn away by the Verdon River over hundreds of years, so today you’ll find a snaking turquoise trail making its way through the cliffs. And before you ask, the water really is this blue! There’s no photo editing trickery or lighting sorcery here. Whether you grab a bird’s eye from above, or take it in up close from a kayak or footpath – you’re bound to fall in love with this enchanting flow of water. The 700m high cliffs certainly have! It’s not all glitz and glamour on the French Riviera, there’s charming bays and wonderful scenery on this stretch of French coast too! A beach holiday here means that you can go from rubbing shoulders with the rich and famous, to enjoying the tranquil setting of a secluded beach in no time at all. 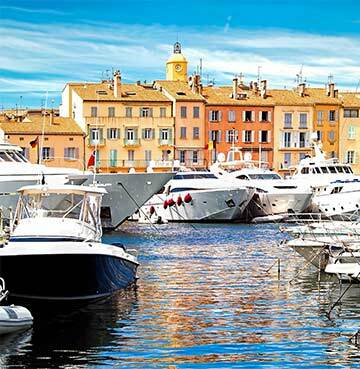 St. Tropez is the perfect example of the beach variety you’ll find in the South of France. See how the other half live on Pampelonne, where the chic and stylish origins of this glitzy coastal paradise all began. Movie stars, famous singers and beautiful celebrities flocked here in the 1950s, sprinkling a little stardust alongside every step in the sand. And you can still mingle with the well-dressed socialites here today. Not for you? Escape the click of paparazzi cameras and the oohs and aahs of celebrity spotters by heading to a secluded cove or beach along the shore. Bouillabaise Beach has that understated allure that’s often more difficult to resist! Golden sand, crystal clear waters and views of the Maures Mountains – just kick back and relax away from the crowds. And with pebbly bays, fishing village charm and lots of natural beauty, you’re guaranteed to find a beach that you love. With a palace once occupied by seven popes and a 12th century bridge dreamt up and funded by a shepherd, the tales behind Avignon’s monuments are just as enthralling as the structures themselves! The Palais des Papes is the perfect blend between defensive sturdiness and fairytale flair. Glance above the arched entrance and you’ll spot two towering spires, fit for a princess in a castle. The corner turret hints at its defensive prowess and long after the popes returned to Italy it took on a new life as a garrison. Today you can tour the ceremonial halls, pop in to admire frescoes in its chapels and roam its elaborate courtyard. Just outside the old part of town, the Pont Saint- Bénézet and its four remaining arches sit pretty over the Rhone. Bénézet may have been a simple shepherd but he had a big idea to make crossing the river a whole lot easier! Boats were no longer the only option, his dream lives on today and the bridge has even earned a place in a famous French nursery rhyme. The chapel you’ll spot between two of the arches was once the shepherd’s resting place and is the perfect decoration on this wonderful bridge. All just a short drive from our Provence villas, this is the perfect day trip for lovers of the past. It might sound a little odd, but one of the world’s best preserved Roman amphitheatres is actually found in the south of France. 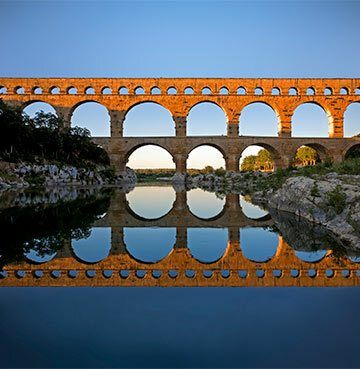 Nîmes is a dream for those who love duelling gladiators and Roman history! A sense of its grandeur hits you as soon as you spot its beautiful arches, sitting atop each other in the two rows of its façade. Inside its battlefield is surrounded by 34 rows of seats, with room for 24,000 spectators. Since the Roman Empire left these shores, the arena has taken on several new lives. From protective fortress to a theatre for bullfighting, and the concert and event venue you’ll find today - there’s plenty to learn on your tour here. Why not make a Roman day of it? Maison Carrée sits nearby and like its neighbour, is another immaculately preserved Roman relic. This temple could be the perfect ending to your day of discovery in Nîmes. Although your Roman roaming doesn’t have to stop there! 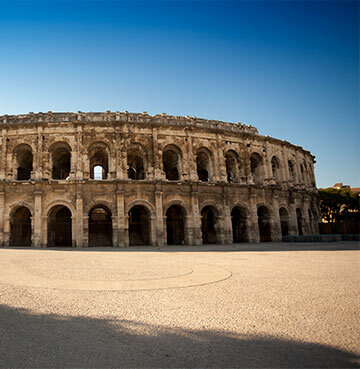 Just a short drive away, Arles offers another amphitheatre that’s just an impressive as the arena in Nîmes. More than 120 arches make up this wonderful stadium, with seating for more than 20,000 spectators. Piling in to enjoy duels between brave warriors and fierce animals, use your imagination and picture yourself as one of these eager viewers sitting in the stands. And just a stone’s throw away, you’ll find Alyscamps – an ancient cemetery with Roman ruins.